Start Playing Now! - Strike! Want to start playing Strike! today? Look no further. You can buy the game at the links below. If you'd like to try before you buy, there is a preview here. In this preview you do not get any of the character creation rules. The adventures on the Downloads page each contain six pre-generated characters to get you started. The preview document also does not contain the rules for creating your own monsters and combat scenarios. If you like what you see and want to get it all, you can buy the game right here. Buying PDFs directly from me using the "Buy Now" buttons means that all your money supports me directly, rather than DriveThruRPG taking a cut. If you prefer to buy from DriveThru, follow the orange links. Strike! is a tabletop RPG with grid-based tactical combat. It's simple to learn and play, but more importantly it gives you all the best things in gaming with nothing slowing you down or getting in the way. Whether you're looking for tactical choices, exciting twists, or making great characters, you'll find it here. Strike! is a setting agnostic game that gives you tactical combat without the slog, a variety of exciting and challenging outcomes in any situation without tedious math, and character advancement driven by play without the bookkeeping. That's what we mean when we say it gives you all the best parts with nothing slowing you down. To buy the PDF, just click on Buy Now, and you'll receive an email with the PDF within 48 hrs. Click here to buy Strike! on DrivethruRPG. A totally remixed version of Tactical Combat designed with vehicles in mind. Fury Chase, modifying Strike's Chase rules to handle a series of running battles. This is Strike! 's take on Mad Max: Fury Road. Advice for giving vehicles mechanical weight as items in the game, along with a collection of vehicles you can use and reskin and a couple of fun vehicle-related custom rolls. Trouble in Hogtown is the second Strike! mini-expansion, and the first adventure for Strike!. Play as a were-raccoon burglar, a wizard with a fixed-gear bike, a half-human busker, a ghostly druid, and more, as you work to uncover the truth behind a series of murders, fight monsters, solve riddles, and save magical Toronto! Inside you'll find 6 pre-generated characters, the adventure itself, sample Twists and Costs to make the GM's life easier, maps, and also a selection of future plot hooks so you can keep playing in magical Toronto after you are finished with this adventure. In Strike! 's first expansion class, you'll find The Rogue, a new play experience built around the ideas of mobility and advantage in combat. Using move actions to set up powerful attacks, this class is perfect for anyone who wants to outmaneuver their foes. The Rogue has the best support of any class for stealthy play, so if stealth is what you're after, this class is a must. Not all Rogues are sneaky, though: you can also create highly mobile attackers who don't use stealth but have other means of generating advantage for themselves and others during combat. The class itself, with three choices of class features: Backstabber, Poisoner, or Brawler. Two Mini-Kits for use with the Kits system: Sneak and Poisoner. Feats - one rogue-specific feat and one feat available to any character. In Strike! Survival, you'll find all the tools you need to make travel and survival stories exciting! Are the characters scrabbling to survive in a harsh world? Flying through space in a cramped metal cylinder? Sailing across the sea? Founding a new settlement in the wilderness? Then you've come to the right place! And at 22 pages, this is the longest mini-expansion yet. Making Travel Interesting and Dangerous Locations, full of ideas, advice, and adventure covering all sorts of terrain and voyages. A Harrowing Tale of Survival, for when that character gets left for dead but somehow manages to make it home alive. Living Off the Land, presenting a structure and rules to support a game of pioneers, traveling into the wilderness to found a new settlement. Four Sample Survival Scenarios, each full of exciting adventure hooks. 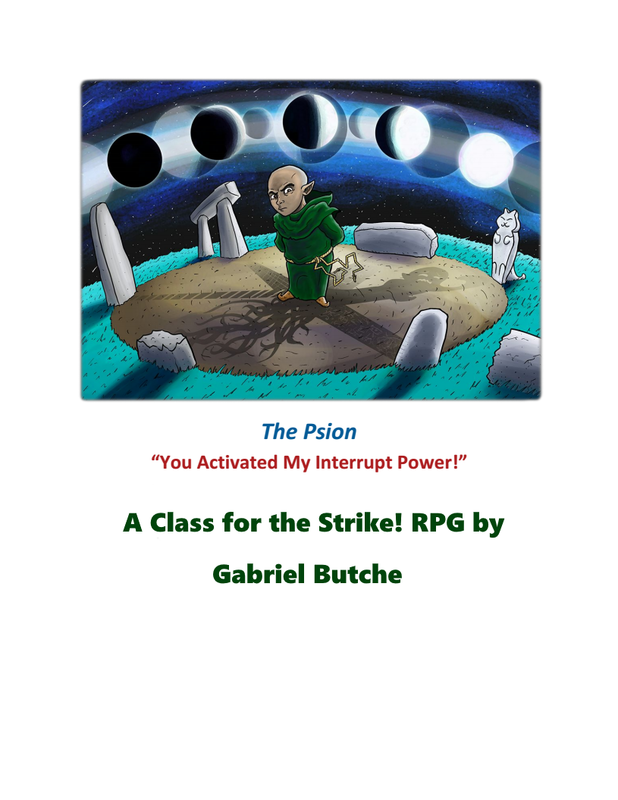 The Psion is an unofficial class for Strike!. While the class is unofficial, I have been involved in Strike! 's development for many years as an active playtester and co-developer, and I brought that experience to my design here. The Psion was designed to be a more complex, reactive class than the others. Specifically, it deals almost exclusively in reaction and interrupt powers. By priming themselves with one of several powers during their turn, the Psion gains access to these versatile options to be deployed at any point during the round. Note that these reactive choices require you to keep a keen eye on the entire battle and, like the Summoner, this class is designed for players who enjoy that level of control and won't be paralyzed by so many choices.